I am a total bag-junkie, which means that I have a bag for work, one for play and one for the gym. I am constantly switching things around in my bags and adding/removing things depending on the day and what my activities are. I often forget essential things because they are in my other bag so I have gathered all of my essentials into one pouch that I can add to any bag. Essential Oils: This is a must. I usually carry around Wild Orange and a Stress Relief roller ball. Wild Orange is the perfect addition to glass of water to wake me up and keep me energized at work. Stress Relief is the most amazing blend and perfect for those days where you have 100 meetings back to back. I usually roll this on my wrists and inhale for 5 seconds for instant relief. Lip Balm: You never know when you will need lip balm. Honestly, its a must. 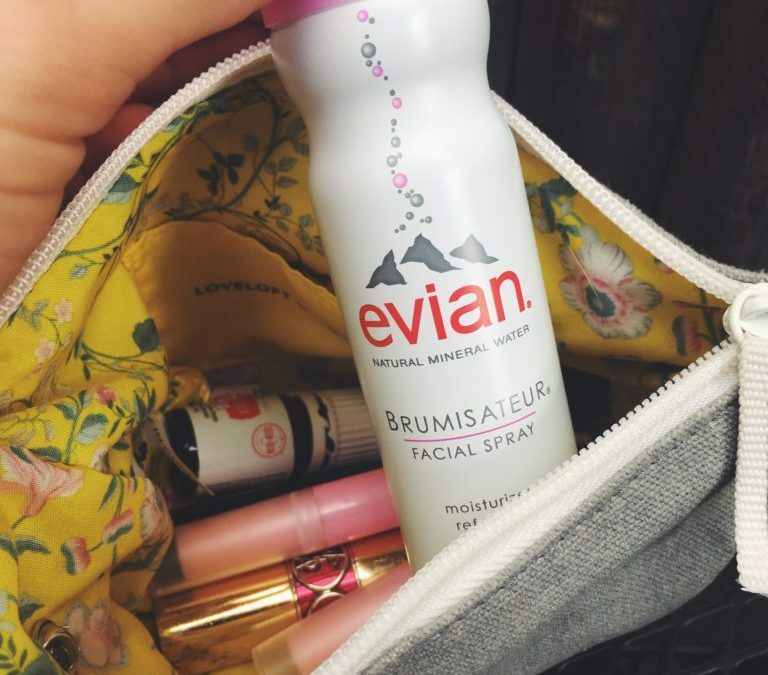 Evian Facial Spray: I just recently discovered this and I’m already obsessed. It is a facial spray that moisturizes and refreshens your skin. Evian delivers a natural pH of 7.2 so your skin will hold onto only the moisture it needs. Inside each bottle are minerals that absorb hydration and finish makeup into a natural look.